Social Media, if done effectively, can be a great way to connect with your audience and promote your program/office/department at the University of Southern Maine. If done incorrectly, social media can prove cumbersome and, and more importantly, can potentially harm the reputation of your program/office/department as well as the university. The University of Southern Maine's overall social media feeds are managed from the Office of Public Affairs. They include Facebook, Twitter, Instagram, LinkedIn, YouTube and Snapchat. Public Affairs has created this page with resources to help you manage an official social media account on behalf of your office, school, college or organization. For further questions, whether determining strategy, setting up a new page, branding and so on, please contact the Office of Public Affairs' social media administrator. The Office of Public Affairs can provide social media guidance to departments/programs by appointment. Below is a presentation on social media produced by the office to help guide individuals in establishing social media profiles. To set up an appointment with the Office of Public Affairs regarding social media, contact USM's social media administrator. The University of Southern Maine (USM) Social Media Policy is your guide to successfully running a social media account at the University of Southern Maine. The policy was revised as of June 14, 2018. USM's Office of Public Affairs will continuously review strategies and best practices for using social media. Since social media is evolving rapidly, the USM Social Media Policy is a document that will evolve over time. If your office, school, college or organization would like to establish a new social media profile, please contact the Office of Public Affairs to go over goals and strategy. All social media accounts acting on behalf of USM must include the following people as administrators on their page: the Office of Public Affairs' social media administrator and director of communications. This is in place in case of emergencies, for when the regular page administrator needs assistance or to serve as a bridge during times of page administrator transition. At the top of your page, navigate to "Settings." On the left, select "Page Roles." Find "Assign a New Page Role" and type in the social media administrator's name. Once found, select the their profile and change the desired role to "Admin." Hit "Add," and wait for the social media administrator to accept the admin request. You will have completed this task. *Please note: These same instructions apply for adding additional administrators to your page, such as graduate or administrative assistants. Current administrators must be Facebook friends with all desired administrators prior to beginning Step 1. For more information, please view the Social Media Policy and the most recent social media presentation from the Office of Public Affairs. If you are a social media account administrator, please fill out this form to be added to our database. If you have established a social media profile, have not yet added the Office of Public Affairs staff as backup administrators and need assistance, please contact Alan Bennett, Digital and Social Media Specialist. It is not required, but we strongly recommend all page administrators create a recognizable @username for their pages. A @username is a unique username created to make tagging the page easier. For example, the University of Southern Maine's @username across all platforms is @USouthernMaine. See USM's example at left. (@usernames make tagging pages easier on Facebook, as seen in the Social Media Basics section below). Scroll to "General" and find "Username"
If your page represents an official USM office, school, college or program, your page must follow USM brand standards. 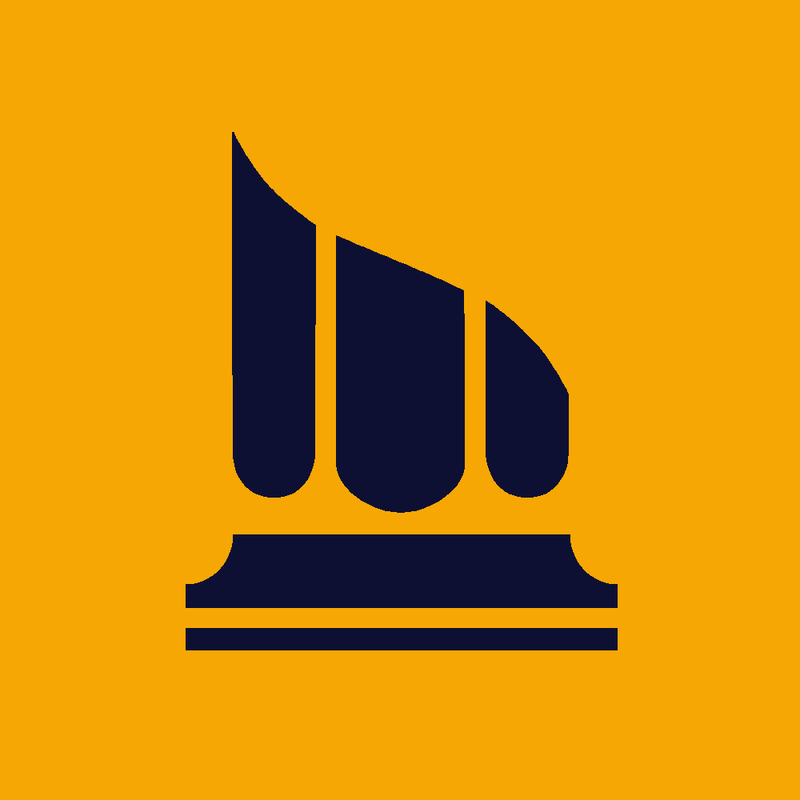 The official university logo is a yellow column positioned inside a blue square. It is for use on official, university-sanctioned pages established and managed by the Office of Public Affairs. Individual departments, programs or organizations are not permitted to use the official logo on their social media pages. All department, program or organization Facebook and Twitter pages affiliated with the university should be properly branded using the avatar below. It is a reverse-color image of the university's official logo for social media purposes only. If you have questions about social media branding, please contact USM's social media administrator. Select the image or download here. As of October 2017, cover images for Facebook and Twitter pages no longer need to be branded with the logo overlay. Cover images should be a crisp, clear single image that represents the office/department and the university well. For all department/school/program/office etc. names used on social media, we are branding them using the following format: “Department/Program/Organization at the University of Southern Maine.” The USM acronym is used by other schools and organizations (such as the University of Southern Mississippi) so always spell out the university's name when used in your page name. For more information on branding, please view the Social Media Policy. Start the conversation on Twitter and Instagram by using some of USM's official hashtags. #USMhuskygram: Got a great picture that showcases life at USM? Use this hashtag to share it with us. #USMspeaks: Use when sharing photos of, thoughts on, or conversations about any lectures you're attending, such as USM's 2017 Gloria S. Duclos Convocation events. #USMintheNews: Use this hashtag when sharing any information about USM or your office, school, college or organization that may have appeared in the media. #USMFaculty: Use this hashtag when mentioning USM faculty members in posts. #HuskyPride: Want to share something that shows off some USM pride? Use this hashtag in your post. Below is a list of guidelines all social media administrators should follow when making a post on their respective accounts, plus tips for specific platforms to best engage with your audience(s). 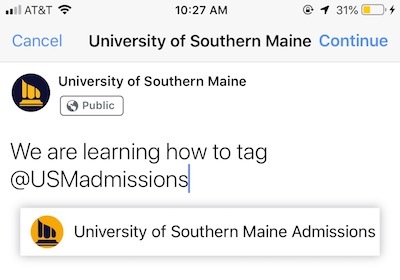 Get in on the fun by tagging or mentioning the University of Southern Maine or one of its additional social media profiles in your posts on Facebook, Instagram or Twitter. Mentioning and tagging brings awareness to additional pages from the USM community. To tag USM or an additional USM page on Facebook, type "@" then start typing the name of the page. For this example, we will use the USM Admissions Facebook page. USM Admissions uses the @username @USMadmissions, making it easy to find and tag their page. Once the page appears in the dropdown menu, select it to insert it into your post. "University of Southern Maine Admissions" will appear in bolded text as a link. In this example, the "University of Southern Maine Admissions" page has been tagged. Once the post is sent, the Admissions page will receive a notification that their page has been mentioned in a post. From there, the Admissions page can choose to share the post. Type "@" then start typing the name of the Twitter handle you want to mention. Once the handle appears, select it from the dropdown menu. Then continue with your tweet. TIP: If you start a tweet by mentioning a handle, put a period before the handle so people can see the tweet. Otherwise, Twitter will think it is a conversation, which will severely limit your reach. Remember, tagging and mentioning brings awareness to other USM pages, so do so when it is appropriate. Research whether anyone mentioned in a news story or post (including the source) has a Facebook page or Twitter account, and, if they do, tag them. This increases the visibility of both your page and the source’s page. The source will likely share (on Facebook) or retweet (on Twitter), increasing visibility further. Understand/speak the lingo of the network you're using, and don’t use jargon where not appropriate. It’s important to be personable, but also professional. Research social media trends/hashtags before using them to avoid a public relations nightmare. (Read about DiGiorno’s Twitter fiasco as just one example). Consider your audience, since certain events or news items may be more appropriate and/or appeal better to a particular group, and not everything needs to be posted. Tailor content to the best platform — younger students tend to prefer Instagram and Twitter, while Facebook typically appeals to a slightly older audience. Visual posts work well on Instagram and Facebook, where short, snappy posts work better on Twitter (see “Play by the rules” below). If using a live video feature, events being streamed should be display appropriate content specifically relating to USM (no political rallies or demolition derbies). Videos should also be horizontal; turn the phone sideways prior to starting a video. For more information regarding video, please see our list of photography and videography tips. Be customer-focused. As you listen for questions and comments, focus on how you can make the customer experience consistent across social media, web, email and more. Humanize your brand. If you are at an event, share behind-the-scenes photos, videos and more. Show who is running the social media account. Keep a (professional) sense of humor. Users are more likely to engage with a brand when they know a person is on the other end. Don’t overshare. The social media landscape is inherently busy. Instead of bombarding your audience with mediocre content, share focused, exciting content less often to drive engagement. Avoid posting too often on Facebook and Instagram in particular, as their algorithms will push excess content to the bottom of the news feed. Help your customers become experts. If you see a lot of the same questions over and over again, consider putting those answers on your department/program website so people will be able to easily find the answers. Engage with users and answer all questions as best you can. Deal with negative feedback quickly and strategically. Respond quickly to negative feedback, and with facts. Play by the rules. Each channel has its own rules and expectations for users. Make sure you’re using each social network the way it is meant to be used. Verify all students/alumni before posting a story about one. The Office of Registration can help verify current students. Contact Larisa Ebinger at the USM Foundation for alumni information. Verify faculty/staff if you aren’t sure who they are. Mentions of faculty being quoted in a news article tend to fare better on Twitter, which is more news-friendly. All athletics teams are "The Huskies," regardless of gender (no “Lady Huskies" allowed). Native links — news stories shared directly on your page — get your feed more views than those shared from other accounts. Posts with just links in the text are ranked lower on Facebook’s algorithm (known as EdgeRank). The link pasted in the post can be deleted on Facebook. Once it registers a link, the text hyperlink isn't necessary. Make it a practice to delete the hyperlink as it shows savviness. Don't fish/beg for likes. Don't ask people to share/like the page. This is not seen as genuine and, as of December 2017, Facebook penalizes pages that routinely ask for shares and likes, making those posts less-discoverable to followers. When responding to comments/questions, respond by tagging the person (provided they are taggable). Posts in which people have to engage get more likes. Calls to Action (“see more,” “read more,” “find out more” and “learn more,” etc.) will almost always prompt more engagement, as will posts with interactive features such as videos, 3D photos or live video capabilities. Read more about Live Video below. Twitter, especially for our audience, is generally more news- and politics-centric. Photos aren't as important, though they are beneficial. Links to news-related content are a must. Tag (@mention) organizations or individuals within sentences to increase the visibility of your tweet. Include relevant hashtags (trending, if applicable) to link back to your tweets. Include photos/videos whenever possible to draw more attention to your content. Retweet only from verified, accurate and trusted sources. Instagram is one of the university's fastest-growing social media platforms. Instagram is a simple tool for showcasing rich media such as photos, videos and infographics. Instagram has evolved over the years. The originator of the square photo format, the platform now allows users to display horizontal or vertical photos and videos; multiple photo/video files in one post; and also "Stories," which are ephemeral, 24-hour posts users can make to highlight the day without clogging their main feeds. If you wish to utilize Instagram for your department or program, look toward these recommendations when making your posts. Do not overuse filters. While tempting, excessive use of filters cloud the reality of what is happening in your photo, and make them appear less than professional. If you wish to use a filter, Instagram now allows users to decrease the transparency of a filter to their desired level. About 30 percent is the most you'll want to go. Don't over-edit photos. When it comes to editing a photo, it can be tempting to over-saturate and expose a photo or bring its sharpness all the way up. Keep editing minimal so as to reflect what is actually happening in the image. Crop out distractions. We've all seen an image ruined by someone making a gesture or face in the background ("photobombers") or by an unsightly object (waste receptacles or clutter). Do your best to minimize these distractions when taking the photo, and crop them out if they linger. Videos uploaded to Instagram can only be 60 seconds (1 minute) long, or they'll have to be clipped in editing. For longer, vertical videos, departments may consider using Instagram TV (IGTV), a new feature that allows videos up to an hour long in vertical format. Please contact the university's social media administrator prior to launching an IGTV channel. Follow our Photography and Videography Tips for more information on the best kinds of photos for news and event purposes. Exercise brevity. Keep captions relatively short, with a focus on why the image was important to share. Don't overdo hashtags. While hashtags are a great way for people to find your content, not every single piece of the photo requires its own hastag. Keep hashtags relevant and to a minimum. Tag individuals/groups associated with the photo. Tag students, university organizations or community partners in your photos so their follows can see your content — and they'll appreciate it, too. Stories are a great way to tell a narrative over time, and are perfect for events. They appear at the top of one's Instagram feed and are comprised of photos and/or 10-second videos that allow users to edit them through drawing, using GIFs, writing text and tagging others and hashtagging. They can be as long or short as you want them to be. To share a story, tap on your profile photo or swipe right when viewing your feed to enter the camera. There, you can begin shooting or you can upload a photo from your camera roll. Keep story length reasonable. Large, long events like Commencement often require frequent posting and so a Commencement story may be longer than, say, one about a student's research project — but that can vary. Keep extra elements to a minimum. It can be tempting to use multiple GIFs, hashtags and text boxes, but these detract from the story imagery when over-utilized. Stick to two or three elements instead. Want people to see your story again? You can save a story for later and add it to your Story Highlights. To do this, go to your page and tap the "+" symbol above your photos. Upload the story, give it a name and save. The Offices of Public Affairs and Marketing and Brand Management have compiled a list of photography and videography tips, with an emphasis on event photography and filming, available for your use. If you have the budget, you may wish to hire an external photographer. Contact Marketing or Public Affairs for a list of freelance photographers. Photo/Video release policy: for any photos taken that may be used for future publicity, please view the signed release policy. Please note that, for social media especially, photos and videos taken using smartphones are more than acceptable to use and post — this is a handy way for you to quickly share content with your followers. Take a look at the photography and filming tips to learn how to take the best photos to meet your needs. Different platforms require different sizes and shapes of photos. View an infographic depicting every size photo you will need to update your social media page. Often times a social media post may require a photo, but one is unavailable. Examples include career fairs, admitted student days or other large-scale events. The USM photo library has dozens of images available for download for use in digital and print materials, as well as on social media. View the public galleries. Live video is an effective way at capturing your audience’s attention, both in the moment and after. When done right, it can be a simple way to expand your messaging potential. It’s not hard, but does take a little know-how. A very good tutorial on how to do this on a mobile device can be found on AdWeek. NPR also has a fantastic guide. Download Facebook Pages Manager from the App Store or Google Play. Log in to your Facebook account (Note: If you have a separate account for page administration, you will need to log into that account instead of your personal account). Tap “Live” denoted by the camcorder icon at the top of the page. Add a brief, detailed description of your video — who, what and where — and then hit “Done. Turn mobile device on its side. For professional events, horizontal video is preferred. Vertical video is not encouraged except for short updates. Hit the camera icon to go live. You are now done with your live video. Take the time to answer questions and respond to comments users have posted during the stream. Mount the mobile device on a tripod, if possible, or prop it up using books or a case. If an event involves speaking and does not have a microphone, use an external mic if possible. Otherwise, get close to the speaker. Contextualize the space. If you can, include some of the background or audience so viewers understand the setting. Turn off the device’s ringer. A video will easily be ruined if you receive a phone call/text during the stream. Instagram Live offers a simple way to go live without the preparation involved with Facebook. The greatest difference between the platforms is that Instagram's live video is vertical, to fit the phone screen. On your mobile device, log in to your Instagram page account. You will automatically be routed to the "Main Feed" of Instagram. Swipe right to enter the "Story" window. Slide the function bar from "Normal" to "Live." Tap "Start Live VIdeo." Your followers will be notified when you go live. Add text, graphics and tags using the functions on your screen. When done, tap "End" in the top right. You can choose to share the video for 24 hours so your followers can check back if they missed the stream. You can also save the video to share elsewhere at a later time. You will have completed your live stream. Hold your mobile device close to your body to steady the device and reduce camera shake. Have text prepared in advance and copied to your phone's clipboard so you can paste it quickly and not waste time during the stream. Many university departments, programs or affiliated organizations also maintain their own social media presence to better connect with their audiences, whether students, faculty or the public at large. Below is a directory of university social media pages recognized as official by the Office of Public Affairs. 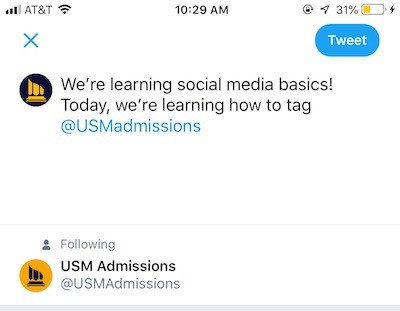 Those wishing to establish a USM social media account must contact the university's social media administrator as outlined in the university's Social Media Policy. Note: If you manage a university-affiliated social media channel and it is not listed below, please contact the university's social media administrator).